My friend Erica is a master of thrifting, so when I finally got the chance for her to share her wisdom on one of my favorite topics, I jumped at the chance. Erica blogs over at The Truth Tea, so go show her some lovvvveee! 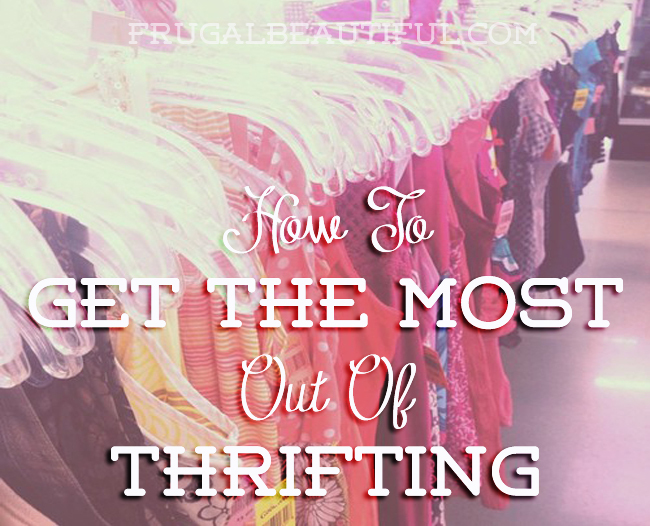 I’ve been thrifting since I was a pre-teen, when my friends and I would scour the aisles of places like Goodwill and Salvation Army and try on anything from 80s prom dresses, band t-shirts and then actual pieces of clothing we’d want to bring home. A lot of people I know say they feel overwhelmed in thrift stores and that it’s simply “not worth it” to go in and peruse the racks to find a hidden gem. 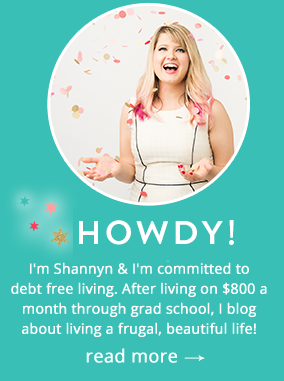 As someone who shops primarily at these stores, allow me to lend you some tricks and tips to make your next thrift shopping experience fun and exciting. After all — you’ll never know what you’ll find at one, and that’s the best part! 1. Give yourself time. Know that this usually won’t be an in-and-out situation. This is where you can feel overwhelmed if you don’t know this ahead of time. There’s a ton of racks filled with an array of colors and knits that will require attention from you. But that’s okay! Take a deep breath and give yourself the afternoon (or early morning) for it. Some stores have everything organized by size which can cut the time in half. 3. Remember the tailor. Don’t shy away from pants too long, shirts too baggy or dresses just a wee bit smaller than you’re liking. Most tailors don’t charge more than $20 for hems and take-ins. 4. Visit more than one store. No two thrift stores are the same. I find a lot at Family Value and Salvation Army, but not so much at Goodwill (normally). Your haul will be more fruitful if you treat yourself to more than one store in your shopping day. Most places even have a few within 10-15 miles, too! 5. Try urban thrift shops for trendy pieces, and suburban thrift shops for more selection and cheaper prices. This goes hand in hand with the tip above. You’re more likely to find discount designer pieces and other ‘trendy’ shops like H&M in the thrift stores that are found in big cities. Buffalo Exchange, Beacon’s Closet and Crossroads Trading are great examples of stores like this. My favorite stores are definitely the hidden gems in rural areas, though. These places are often less expensive and way less picked over. BUT, they usually lack the designer duds. Still if you’re like me who likes the challenge of dressing up basic pieces, you’ll have luck. 6. Figure out what you need. Sometimes if you go with a goal in mind (“I need a jacket”, “I need black pants”) you can bypass the overwhelming feeling and go for the gold. My favorite thing about thrifting though is that sometimes the things you find, you never know you needed until it was found. Have you ever thrifted? If so, what’s your favorite item you’ve thrifted? Thanks for the tips on men’s wear and looking in the children’s section! I LOVE thrifting. Your absolutely right about how it takes so much time. My husband and I actually make dates out of going to the thrift store. We will often go to our favorite Goodwill, then we sit down over coffee and think it’s the best date in the world. My husband’s most recent score was a $190 bike rack for $14. I recently bought a summer purse worth more than $150 for about $20. A good tip is to buy out of season merchandise for the next year. It’s hard to wait, but it’s so worth it, pulling out “new to wear” clothes without the price tag. I used to work at Ann Taylor, and remember crying when my husband asked me if spending $80 on a cashmere sweater was a good use of our money. I cried, but went thrifting the next week and found a beautiful Lands End cashmere sweater for far far less. Thrifting has decorated my home and my wardrobe, plus my husband never complains about my buying a new shirt. One more thing, I never feel guilty throwing a ruined shirt into my husband’s garage rag pile. I totally agree! You sound like you got some amazing scores! I’m still giddy over my KitchenAid Mixer for $40…I just about died! I sometimes envy places you live at! I wish I could go thrift store shopping but we don’t have any thrift shops in my area, it’s just so unique you know, not like the mass produced stuff that everyone is wearing. Ya, I’m lucky I live in an area with great thrift stores, but sometimes I have to trek out to the burbs…the prices are usually better out there and you can find adorable vintage stuff that hasn’t been snapped up by the resale boutiques in the city! I couldn’t agree more. I have four thrift stores within a 5 mile radius. I try and hit them each Saturday morning. I get there early. Many stores offer 1/2 tag sales or special discounts during the week. Two of my favorite local shops even have reward cards for frequent shoppers. Yesterday I found a great winter coat for my daughter who is in college in Chicago. I used my 10.00 off coupon that I had earned and only paid 8.00 for a full length lined wool coat. It will probably cost more. I love thrifting! In Poland where I live we don’t really have that many thrift stores, the offer is rather limited to second hand stores with clothes and some toys maybe. However we have a well develped system of internet auctions and that’s where I fid most of my gems, foth for muself and family or my clients. Best finds so far? My sister’s wedding dress – an online auction. She is very tall and slender and started shopping for a dress way to late. We found her drem model online, and the cost was around 20% of the shop version. The second best – a huge sliding mirror door wardrobe for my parents. They live in a flat which was built from pre-prepared modules (typical building in my area) and I fopund a wardrobe which was made to measure for a flat with exactly the same layout, but in another part of the city. The price with relocating the furniture and assembling it was about 10 times less than if they ordred in the shop. Yay!